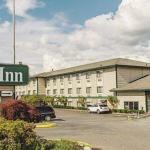 Offering free Wi-Fi free breakfast and fresh coffee and scrumptious cookies in the lobby the Guesthouse Inn Bellingham is a few blocks from Arne Hanna Aquatic Center and Joe Martin Stadium. This cozy hotel offers 81 rooms with free Wi-Fi refrigerators microwaves premium cable hair dryers and ironing equipment. Guests can also get online at the on-site computer. Enjoy a free USA Today as you dig into your hot waffles for breakfast and in the afternoon relax in the indoor hot tub. Copy and fax services are available. Parking is free. Just off I-5 this hotel is a block away from Joe Martin Stadium the aquatic center and Civic Field Park. Western Washington University is two miles away. Enjoy a hike in the Whatcom Falls Park three miles away or explore historic downtown with the bustling waterfront Whatcom Museum of History and Art and Mt. Baker Theatre about two miles away. Bellingham International Airport is six miles away.